We have the apartment you are looking for. Located in the city centre and steps away from the main attractions. Furthermore, you can easily reach the port through the Via Laietana. 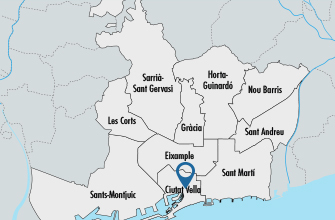 Explore Barcelona from the indicated place. The apartment has 110 square meters spread across in two double rooms and two single rooms, and a capacity to accommodate up to 6 people. Only families and persons older than 35 years of age may make reservations for more than 3 persons. Your entertainment is guaranteed in the living room. It includes TV, WiFi and a dining table to enjoy and share your meals. You can prepare and cook your favourite dishes in the well-fitted kitchen fully at your disposal. If you want to relax with a good book, just go to the 12 m² terrace. The apartment is located in a traditional building. From here you can walk to Barcelona’s main attractions. Plazas, tours and Gothic buildings are found all over around in the surroundings. Also, you get a lively atmosphere with the restaurants, ‘tapas’ places and bars. If you want the full experience in Barcelona, you won’t find a better location than this. The Barri Gòtic is a visitors’ favourite area and its located next to the appartment. You will be close to everything and you may get to know the majestic buildings there to find, among which, is the ‘Church Santa María del Mar’. Galleries, restaurants and shops are spread throughout the neighbourhood. Art lovers must visit the Museu Picasso (Picasso Museum) and continue further on to the historical Museum of Textiles. The favourite shopping area is the Portal de L'Angel, but if you want something different, go to the Argenteria Street, where you also have restaurants, ‘tapas’ places and original shops. The plazas around the area have each its own charm. In the Plaça del Rei is located the Museum of History, while in the Plaça Sant Jaume the political centre. Go to the ‘Cathedral of Saint Eulalia’ and enjoy its famous gardens. All within walking distance. Walk by the Via Laietana which links the city centre with the port. There you will see historic and modernist buildings. At night, enjoy the Passeig del Born, where you have a great variety of bars for all tastes.